From small little cozy cottages in the woods, to larger multi room cabins, if you're looking for something out of the ordinary, you might want to try a Big Bear cottage for your next vacation. Cozy, warm and with a welcome smile, the innkeepers will greet you and make your stay in the mountains very memorable. Cottages are generally very close to cabin style accommodations. They are cozy inns with big fluffy beds, and some have amenities like fireplaces. Often there is a coffee maker in the room or a hot plate, but don't expect to find a full kitchen or a lot of cooking supplies. Like a Bed and Breakfast Inn, a Big Bear cottage may serve breakfast or have a simple buffet where you can "grab and go" and get on to the days activities. Either way, you will be greeted and cared for by the innkeeper who will take great care of you. Often when people say "I want a cottage in Big Bear" they are thinking of a cabin which is more of a standalone home in the woods. 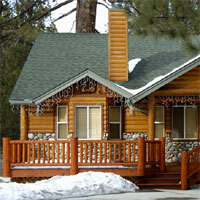 We have over 400 Big Bear cabin rentals if you are looking for something more grand or for a bigger family.